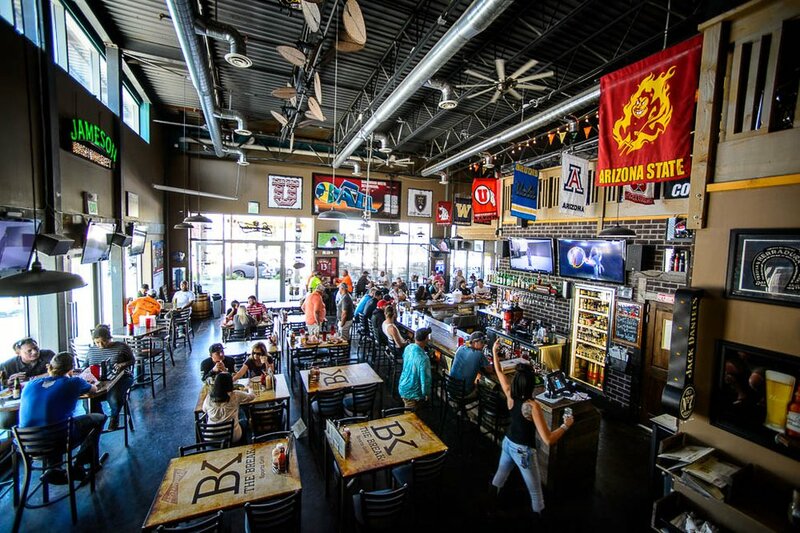 (Trent Nelson | The Salt Lake Tribune) No one wants The Break to become a bar — not its owner Bam Peck, or the South Jordan City Council. But the parties say they have no choice because the Legislature did away with the dining club liquor license. Now The Break, and dozens of other Utah businesses, have to choose between being a bar (no one under 21) or a restaurant (must order food to drink). James Bam Peck at The Break Sports Grill in South Jordan, Friday June 1, 2018. (Trent Nelson | The Salt Lake Tribune) No one wants The Break to become a bar — not its owner Bam Peck, or the South Jordan City Council. But the parties say they have no choice because the Legislature did away with the dining club liquor license. Now The Break, and dozens of other Utah businesses, have to choose between being a bar (no one under 21) or a restaurant (must order food to drink). The Break Sports Grill in South Jordan, Friday June 1, 2018. James(Trent Nelson | The Salt Lake Tribune) No one wants The Break to become a bar — not its owner Bam Peck, or the South Jordan City Council. But the parties say they have no choice because the Legislature did away with the dining club liquor license. Now The Break, and dozens of other Utah businesses, have to choose between being a bar (no one under 21) or a restaurant (must order food to drink.). James Bam Peck at The Break Sports Grill in South Jordan, Friday June 1, 2018. 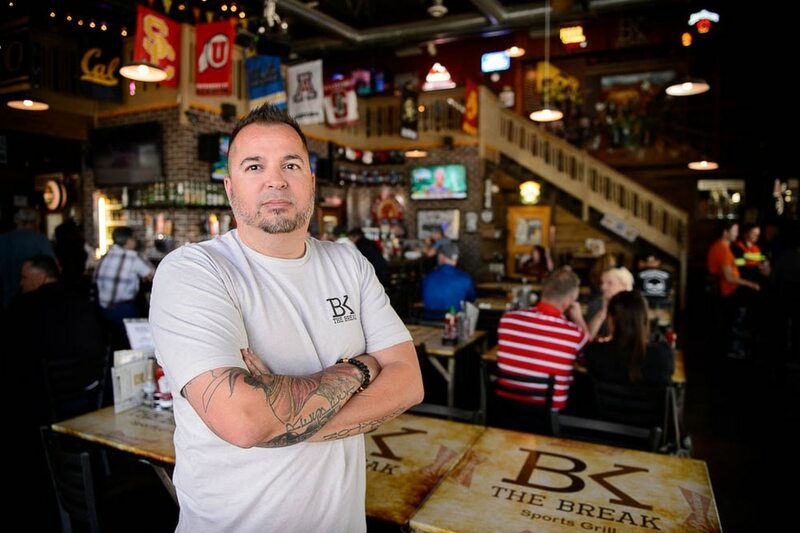 (Trent Nelson | The Salt Lake Tribune) No one wants The Break to become a bar — not its owner Bam Peck, or the South Jordan City Council. But the parties say they have no choice because the Legislature did away with the dining club liquor license. Now The Break, and dozens of other Utah businesses, have to choose between being a bar (no one under 21) or a restaurant (must order food to drink). The Break Sports Grill in South Jordan, Friday June 1, 2018. (Trent Nelson | The Salt Lake Tribune) No one wants The Break to become a bar — not its owner Bam Peck, or the South Jordan City Council. But the parties say they have no choice because the Legislature did away with the dining club liquor license. Now The Break, and dozens of other Utah businesses, have to choose between being a bar (no one under 21) or a restaurant (must order food to drink). The Break Sports Grill in South Jordan, Friday June 1, 2018. (Trent Nelson | The Salt Lake Tribune) No one wants The Break to become a bar — not its owner Bam Peck, or the South Jordan City Council. But the parties say they have no choice because the Legislature did away with the dining club liquor license. Now The Break, and dozens of other Utah businesses, have to choose between being a bar (no one under 21) or a restaurant (must order food to drink). The Break Sports Grill in South Jordan, Friday June 1, 2018. 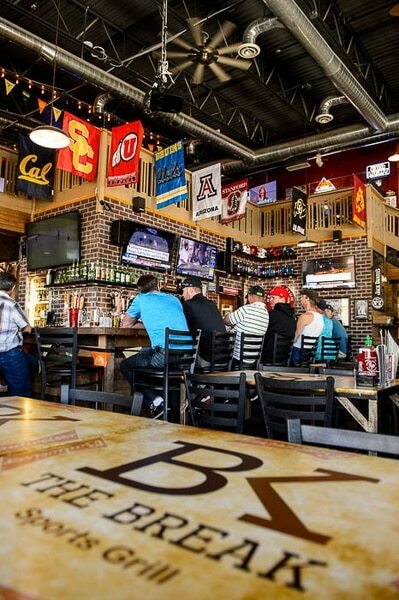 (Trent Nelson | The Salt Lake Tribune) No one wants The Break to become a bar — not its owner Bam Peck, or the South Jordan City Council. But the parties say they have no choice because the Legislature did away with the dining club liquor license. Now The Break, and dozens of other Utah businesses, have to choose between being a bar (no one under 21) or a restaurant (must order food to drink). The Break Sports Grill in South Jordan, Friday June 1, 2018. Leaders in South Jordan and Herriman have — at least in modern times — been able to keep bars out of their cities. Times are changing, though, and later this month both south Salt Lake Valley communities could finally be home to 21-and-older drinking establishments. The cities have been forced to make the change, thanks to a state law that eliminates Utah’s unique dining club designation. Business owners who have the special dining club liquor license from the Utah Department of Alcoholic Beverage Control have until July 1 to decide whether they want to get a restaurant liquor license (which requires patrons to order food with alcoholic beverages) or a bar license (which allows only those 21 and older on the premises). Dining clubs are a hybrid of the two licenses and offer more freedom. That’s why — since 2017, when the change was approved as part of a massive overhaul of Utah’s liquor laws — dining club owners had fought to keep the designation. Like a bar, the dining club allows adults to drink alcoholic beverages, without also having to order food. But minors are allowed inside when accompanied by adults. By allowing business owners to choose their new liquor license designation, state lawmakers failed to consider what cities may want, explained South Jordan City Attorney Ryan Loose. Which South Jordan has done for decades. If things go as planed, the new bars in South Jordan will be The Break Sports Grill, 11274 S. Kestrel Rise Road, and Market Street Oyster Bar, 10702 S. River Front Parkway. In Herriman, ’Bout Time Pub & Grub, 5502 W. 13400 South, will be the first bar. (Trent Nelson | The Salt Lake Tribune) No one wants The Break to become a bar — not its owner, Bam Peck, or the South Jordan City Council. But the parties say they have no choice because the Legislature did away with the dining club liquor license. Now The Break and dozens of other Utah businesses have to choose whether to be a bar (no one under 21) or a restaurant (must order food to drink). The Break Sports Grill in South Jordan, Friday, June 1, 2018. 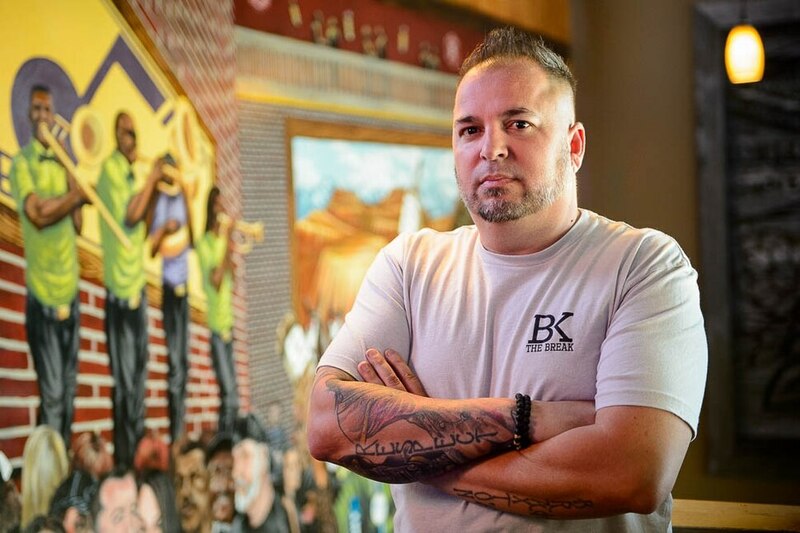 James “Bam” Peck, the owner of The Break in South Jordan’s booming Daybreak development, said he’d prefer to stay a dining club, but the law won’t allow it. He pondered what to do for months, but ultimately Peck decided to change to a bar so that patrons could carry alcoholic beverages around the establishment — something that is not allowed in restaurants, where patrons are required to be seated to order and consume alcohol. When he approached South Jordan to get the required local consent for a bar, though, council members denied his request, saying city ordinances did not allow for bars. He then hired a lawyer, who contacted Rep. Brad Wilson, R-Kaysville, who sponsored the initial legislation. Wilson has told cities he doesn’t want them to take away the bar/restaurant choice called for in the law. Reluctantly, the South Jordan City Council decided to change its bar policy. In the coming weeks, Loose said, it is expected to change the wording to allow only those businesses that held dining clubs at the time the new law was approved in 2017 to become bars. The Break and Market Street Oyster Bar are the only two businesses in the city that fit that description. No others bars likely would be allowed, Loose said. The city also would prevent the bar license from transferring to a new owner. Herriman didn’t have an ordinance that allowed bars, either, said spokeswoman Tami Moody. But when ’Bout Time asked to become a bar, “support from the City Council was unanimous,” she said, adding that the city also is in the process of reworking ordinances to possibly accommodate more bars. A state liquor store also is expected to open next year in Herriman.